The Learning on the Lakeshore planning group has decided that the LOTL Conferences held over the last five summers have met our goals. We have decided not hold future LOTL Conferences. We appreciate the volunteer presenters, attendees, sponsors, and host sites - of Mona Shores High School and Muskegon Community College. We want to thank Steve Denniston, an area educator who recognized a need and was the organizer and co-chair for a number of LOTL Conferences. Note: This site will remain up until 2020 because of the links to presenter resources. With a goal of easy access and saving paper, presenters are invited to share their presentation resources in a shared Google folder organized by presenter and within that folder, by presentation. This also provides access to resources for presentations you may not be able to attend. 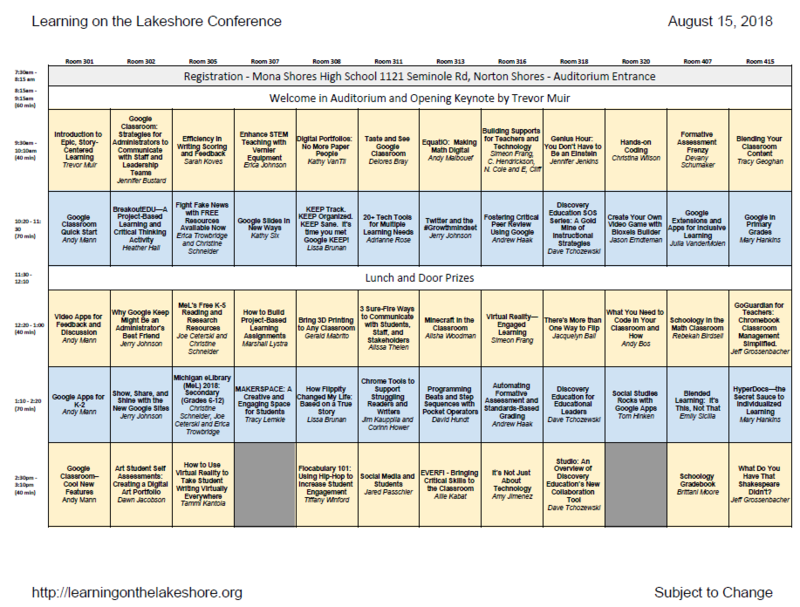 Help plan the sessions you will attend with the conference schedule. WIth nearly 60 different breakout different sessions, you'll have a hard time deciding what to attend. Whether you're a special education teacher, a secondary math teacher, an administrator, or an iPad using teacher - there is something for you. To help you get started, the planning committee created a subset of breakout sessions. Click the icon below to open the specific document. 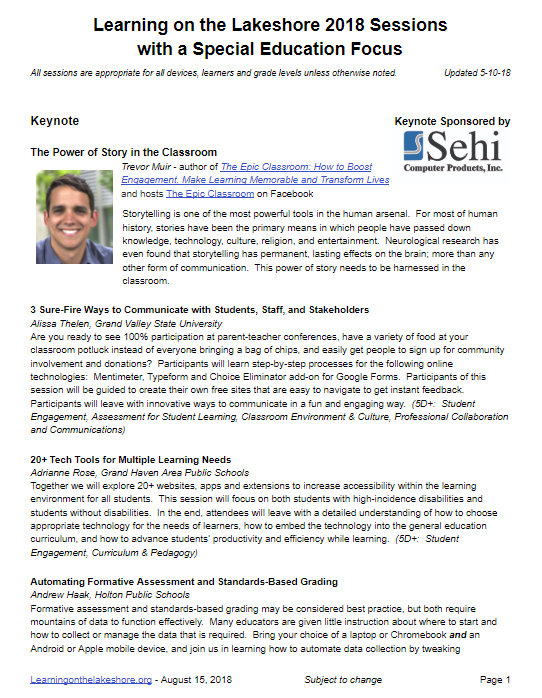 To see all breakout session descriptions visit http://bit.ly/lotl18sessions Consider this as a starting point.